Our Body Plugs can be used for various uses and applications. Body Plugs are listed below in order of the sheet metal hole size, which will be slightly smaller than the actual hole on your vehicle. 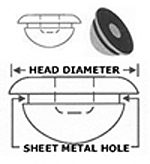 The picture provided on this page is an example of how to measure grommets. Individual parts may appear slightly different.